Now that Locus Magazine has published its recommended reading list for 2010, I can once again dig into my spreadsheets and take a look at how this year’s data reflects on the state of short stories. I’ve been monitoring the list’s short fiction category for a few years now and have always found the results interesting. Online magazines represented: Clarkesworld, Lightspeed, Strange Horizons, Subterranean, Tor.com, Fantasy, Apex, Beneath Ceaseless Skies, and Shareable. Anthology/Collections/Chapbooks represented: Is Anybody Out There?, Sprawl, Zombies vs. Unicorns, Swords & Dark Magic, What I Didn’t See and Other Stories, Sourdough and Other Stories, Stories, Gateways, Wings of Fire, Full Moon City, The Beastly Bride, Temporary Culture, The Man with Knives, Songs of Love and Death, and Masked. There is a two-way tie for publications with the most recommended short stories. One online magazine (Clarkesworld) and one print magazine (Asimov’s). These two magazines were two of four tied for first last year. 3 – Is Anybody Out There? This is the first year that there have been more stories selected from online venues than from books or print magazines. Although the number of stories on the list increased by 111%, growth within the categories was not proportional. Online magazines increased their total by 212%, but anthologies/collections/chapbooks and print magazines respectively declined to 71% and 75% of last year’s figures. Anthologies/Collections/Chapbooks spent the last four years at the top. This is their first decline since 2005. Overall, print magazines continue to decline as a presence on the list. Three years ago, Asimov’s (alone) represented 25% of the entire list. That’s more than all of this (or last) year’s print magazines combined. Notable publications absent in the short story category: Analog, Realms of Fantasy, and Interzone. 38 stories are by women, giving them the majority. 20 of those stories were in online magazines. 12 stories were in print magazines. 18 in anthology/collection/chapbooks. (30 for men, 16 online magazines, 12 print magazines, 2 in a/c/c). 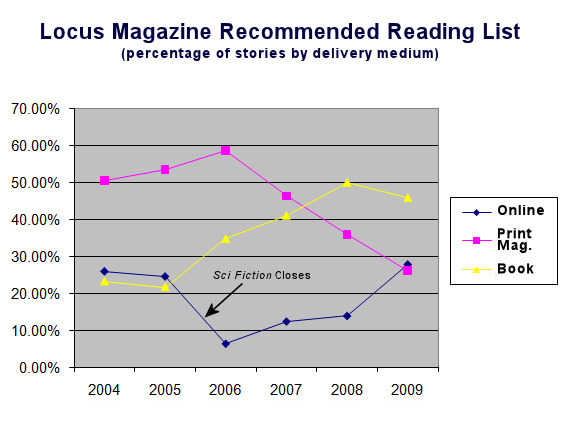 Now that Locus Magazine has published its recommended reading list for 2009, I can once again dig into my spreadsheets and take a look at how this year’s data reflects on the state of short stories. I’ve been monitoring the list’s short fiction category for a few years now and have always found the results interesting. Online magazines represented: Clarkesworld, Fantasy, Lone Star Stories, Strange Horizons, Subterranean and Tor.com. There is a four-way tie for publications with the most recommended stories. Two online magazines (Clarkesworld and Strange Horizons), one print magazine (Asimov’s), and one anthology (Postscripts). In 2009, Postscripts switched from a magazine to an anthology series. The selected story appearing in Cosmos is available online, but was originally published in the print edition of the magazine and is counted as such. This year’s list represented a greater diversity of publications. This is the first year that online stories have outscored stories from print magazines. Although the number of stories on the list increased by 122%, growth within the categories was not proportional. Online magazines increased by 243%, anthologies/collections/chapbooks increased by 112%, and print magazines declined to 89% of last year’s figure. Anthologies/Collections/Chapbooks saw very little change from last year. This is their fourth consecutive year at the top. 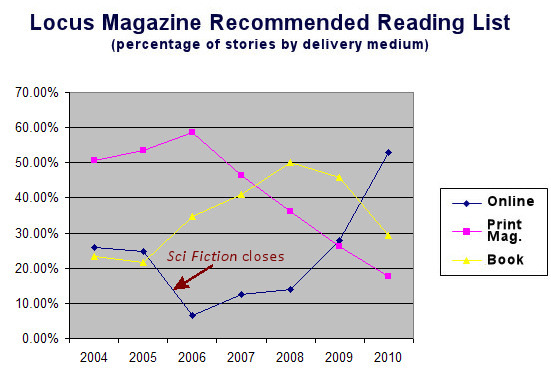 Postscripts converting from a magazine to an anthology had an impact on the category distribution. (It has been argued that Postscripts was always an anthology since it bore an ISBN instead of an ISSN. I’m not convinced.) In prior years, we’ve seen print magazines switch to online (Fantasy, Subterranean). These migrations are proving significant. Print magazines continue to decline as a presence on the list. Two years ago, Asimov’s (alone) represented 25% of the entire list. That’s more than all of the print magazines combined this year. The Locus Recommended Reading List for 2008 has been published. For the last two years (2006, 2007), I’ve taken a close look at the short story portion of the list and given a summary of my findings. The 2008 list contains 50 short stories, which is 7 less than last year, but still more than the year before (45). There are twenty-four different markets are represented, up from twenty-one in 2007. The number of markets on the list with two or more stories is 14 (58%), which is up from last years 11 (52.4%). Seven stories (14%) were selected from the four online markets are represented (Clarkesworld, Fantasy, Tor.com, and Abyss & Apex). This is the same number of online markets as last year, but a slightly higher percentage. Of these, Clarkesworld was the only market to repeat from last year’s list. (The number of stories appears to be the same as well, but to be certain, I need to go back and see how many of Subterranean’s stories from last year were actually online vs print.) Among others, three significant online magazines, Subterranean, Baen’s Universe, and Orson Scott Card’s Intergalatic Medicine Show, did not appear on this year’s list. With print magazines, F&SF maintains the top spot, while Asimov’s continues to drop. Two years ago, Asimov’s stories claimed 25% of the list. Today, they have 8%. Analog, the current leader in terms of subscriptions and sales in the US, once again failed to place a single short story. Realms of Fantasy has also dropped off the list. Half of this year’s stories are from anthologies or collections, which is up considerably from last year’s 39%. This represents 14 markets (58%) in 2008 and 9 markets (42.9%) in 2007. This will likely fuel the continued debate over whether or not magazines have lost their position as the place to find the best new short fiction. Last year, I read the Locus Recommended Reading List for 2006 for Short Stories and was a bit disappointed by how lop-sided it appeared and by the number of markets represented. This year’s list looks a lot better to me. It is considerably longer (45 stories vs 57) and the number of markets with 2 or more stories on the list grew from 7 to 11. Asimovs went from 25% of the list to 14%, which was more in line with my expectations. It’s also nice to see 4 different online magazines (Challenging Destiny, Clarkesworld, Strange Horizons and Subterranean) represented. If I have some time later, I may poke through the novella and novelette results. Congratulations to everyone who made the list! A special congrats go to Barth Anderson, Elizabeth Bear, and Jeff VanderMeer for their Clarkesworld stories that made the list. Did this surprise anyone else? 45 stories made the list. Asimov’s gets nearly 25% of the recommendations and as someone who reads a lot of short stories, I never expected things to fall out that way. It should be interesting to see how this compares to the multitude of Year’s Best collections. This is NOT a criticism of the stories selected. In fact, congratulations to all of you.